The United Nations officially announced on Wednesday in New York the appointment of former German President Horst Köhler as the personal envoy of the United Nations Secretary-General, Antonio Guterres, for the Sahara, in replacement of American Christopher Ross. The appointment of the new UN envoy for the Sahara comes after the approval of Morocco, which took the time necessary to scrutinize the candidature and profile of the new mediator in view of the sensitivity of the Sahara dossier. 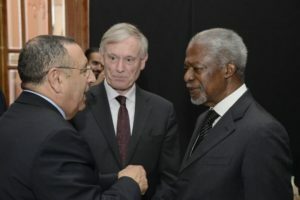 On the contrary, the Polisario, which is in a hurry to resume talks with Morocco, frozen for years, had approved Köhler’s candidacy shortly after it was announced by the new UN Secretary General Portuguese Antonio Guterres. The German Horst Köhler will thus be the second European to hold this position after Dutchman Peter Van Walsum. Following the resignation of Christopher Ross, the Polisario and its Algerian sponsors were rather favorable to his replacement by another American personality because they still have bad memories of the former Dutch mediator, Peter Van Walsum. Actually, before handing over the relay to Christopher Ross, the Dutch diplomat had concluded that the Sahara independence option claimed by the Polisario was unrealistic and impracticable. Köhler, who has held numerous positions in the German government and in international financial organizations for over 35 years, including the IMF (2000-2004) and the EBRD (1998-2000), thus succeeds the American Christopher Ross who failed in his mediation mission in the Western Sahara conflict. Rabat criticized Ross for his partiality in favor of the Polisario separatists and especially of the Algerian rulers with whom he maintained good and discreet relations since the time when he was ambassador of the United States in Algeria from 1988 to 1991. It remains to be seen whether the new personal envoy of Antonio Guterres will be able to succeed where his American predecessor has failed by observing objective neutrality in the delicate mission that awaits him in the Sahara.